Most people spend the week before a marathon resting up and carbo loading. But in recent days, the radio host Ira Glass, the pastry chef Dominique Ansel and a crew of other long haulers have been worrying less about leg cramps than semicolons. The marathon in question is a weeklong “nomadic reading” of Marcel Proust’s “Swann’s Way” that will celebrate the centennial of that first installment of “In Search of Lost Time” by bringing Proust’s endlessly subdividing sentences, microscopic self-consciousness and, yes, plenty of madeleines to seven Proust-appropriate locations across New York City. In Mr. Glass’s case, that would be a bed in a room at the Wythe Hotel in Williamsburg, Brooklyn, where, at 7 p.m. on Friday, he will recite the book’s opening — “For a long time, I went to bed early” — from under the covers before passing the baton, so to speak, to the next in a chain of nearly 120 readers recruited by the French Embassy’s cultural services division. This year’s centennial has already been honored by academic conferences and an exhibition at the Morgan Library & Museum, featuring manuscripts that had never before traveled outside France. But the mostly English-language nomadic reading, to be followed next weekend by a more agoraphobic-friendly 20-hour overnight event at Yale University staged inside a re-creation of Proust’s cork-lined bedroom in Paris, offers a chance for para-Proustologists, as scholars have been known to call their amateur counterparts, to get into the act. Sure, Bloomsday has the Guinness. But the nomadic reading will have madeleines baked by Mr. Ansel (better known as the inventor of the Cronut) and a deep bench of partisans eager to plump for the more intimate pleasures of Proust. For those lacking the stamina to take in every word of “Swann’s Way” at a gulp, shortcuts are available. Harold Pinter’s unfilmed 1972 “Proust Screenplay,” which boils down all seven volumes of “In Search of Lost Time” to about three hours, will have its first American hearing at a staged reading at the 92nd Street Y in January. If that’s still too long, the classic Monty Python “All-England Summarize Proust Competition” skit is waiting on YouTube. Mass readings of “Remembrance of Things Past” (as some partisans of C. K. Scott Moncrieff’s translation still call Proust’s novel) are not an exclusively American phenomenon. Since 1993, for the project “Proust Lu” (“Proust Read”), the French filmmaker Véronique Aubouy has shot over 100 hours of more than a thousand ordinary people reading the work sentence by sentence, while sitting on top of a tractor, wading in a lake or standing in a hat shop — and she’s only partway through Volume 4. But in the United States the embrace of the difficult and very French Proust may be a way of asserting one’s allegiance to the madeleine over the freedom fry. American Proustmania can lead to some awkward cross-cultural moments. Harold Augenbraum, founder of the Proust Society of America and a participant in the nomadic reading, recalled the startled reaction he got a few years ago from the attendant at an Art Nouveau pissoir under Paris’s Place de la Madeleine when he asked if he could lead a tour group of American Proustians in an impromptu reading of a scene in which the moldy smell of another urinal awakens a particularly pungent memory. There may be similarly puzzled reactions at the New York Botanical Garden in the Bronx on Sunday, should unsuspecting visitors happen upon students from the Lycée Français and the French American School of New York who will be reading (presumably more wholesome) passages in a patch of forest, chosen to represent young Marcel’s paeans to the countryside. Ms. Weber will be reading on Monday at the Oracle Club, a private arts space in Long Island City, Queens, meant to evoke the grand salons Proust frequented before illnesses real and imagined consigned him to bed. NOMADIC READING Friday to Thursday; various locations in New York; frenchculture.org. 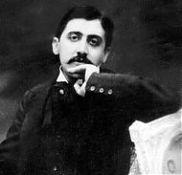 THE YALE PROUST MARATHON Nov. 16 to 17; New Haven; proustatyale.com. ON PROUST Panel with William C. Carter, Jennifer Egan, Laurent Mauvignier and Olivier Rolin; Nov. 17, 11 a.m.; 92nd Street Y, 1395 Lexington Avenue; 92y.org. REWRITING PROUST Panel with authors. Nov. 19, 7 p.m.; Center for Fiction, 17 East 47th Street, Manhattan; centerforfiction.org. PINTER/PROUST Jan. 16; 92nd Street Y; 92y.org.